Tooradin-raised swimmer and Olympian Josh Beaver is leading the charge for Swimming Australia’s newest initiative; Australia Swims. Beaver, who competed at the 2016 Rio Olympics and also boasts two silver and two bronze Commonwealth Games medals, swam at the Portsea Swim Classic on Saturday as part of a 10-day celebration that aims to inspire Australians to reconnect with their love of swimming for its many health, wellbeing and social benefits. “I’ve been working with Swimming Australia for the last six months and we’ve just launched Australia Swims,” Beaver said. “Basically what we’re trying to do is have more people around water, involved in water and by doing that we’re pledging swims to swim a virtual lap around Australia in 10 days. 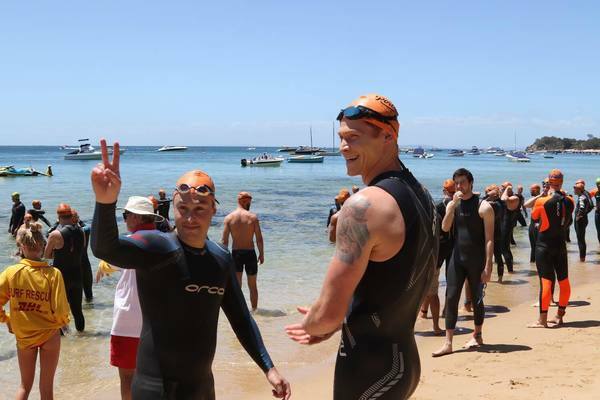 “I’m obviously pretty passionate about swimming myself, so I’m talking to people about the advantages of being around water and swimming, and also creating awareness and inspiring people to be around water. Swimmers can pledge and track their distance on a new interactive app, iSwim, created by Swimming Australia, to be a part of the collective 35,855km lap around Australia. The backstroke specialist, who won bronze in the 200m backstroke event at the 2018 Gold Coast Commonwealth Games, swam 1.5km at the Portsea Swim Classic and says the collective effort to swim around Australia is on track. “We had some really good pledges over the weekend and I think we’re over the Northern Territory at the moment, which is fantastic and there’s still one more week to go,” he said. Beaver talked about his love for getting out in the community and inspiring young swimmers. “I’m really passionate about it and I’ve always enjoyed getting out in the community, sharing my story and inspiring the next generation of Australian Dolphins,” he said.